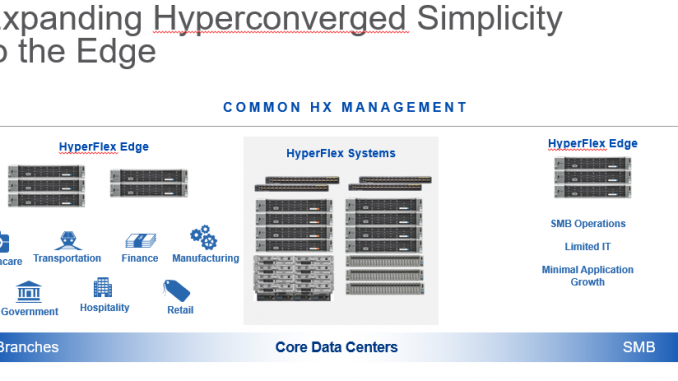 HomeTechnicalData CenterWhat is Cisco Hyperflex Edge ? What if you are a company with lots of branch offices and those offices are to small for a Cisco Hyperflex cluster. Or you are just a small company who doesn’t need much compute, memory, iops and storage capacity for you office. Think of offices where you just need and Active Directory Server, DNS, DHCP, File and print server etc locally. There is no need for a lot of iops, compute or memory. Cisco got now a great solution for offices that doesn’t require much compute, storage and memory, but still want to have the advantage of Cisco Hyperflex. 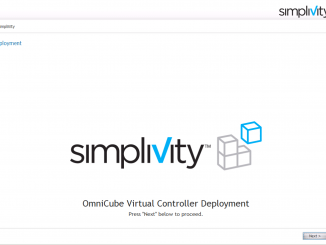 It uses the same installation ova as Hyperflex. 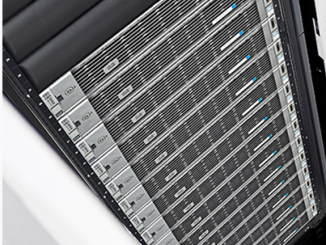 Which means that the installation and configuration is almost as easy as a Cisco Hyperflex cluster with Fabric Interconnects. There are some limitations right now, but for the small offices they are still great. The system got 3x C220 nodes wich got 1 OR 2 CPU per node. 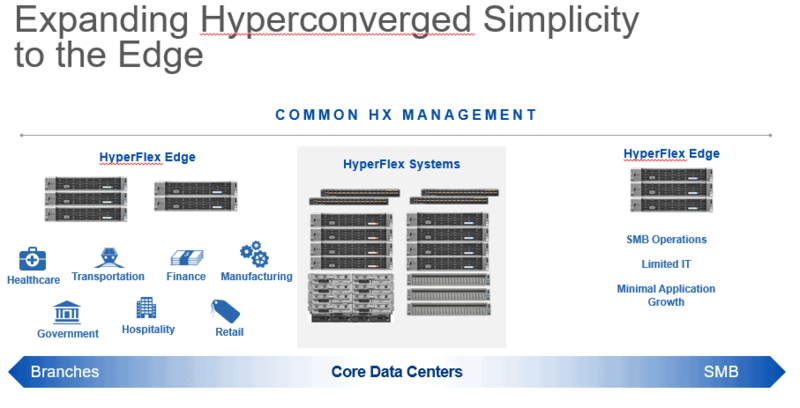 The Hyperflex Edge system CAN NOT be expanded right now. You can start as low with 3 drives and expand it in the future to 6 drives. The fiexed configuration got 128 Gb memory which is a lot for the small sites. Right now the HX nodes are connected with the 1 Gb links to a switch. This switch can be a nexus, catalyst or other switch. As long as it understand trunks and got the capability to use vlan’s. By using the replication factor of 2 you will have 4.5T-9T storage space available. Although this is a small system, one node can still be unavailable and the system keeps running. Although the system only uses 1 Gb ports, there is two 10Gb ports available, but they are not used in a Cisco Hyperflex Edge configuration. The data is using 1 fysical port while the storage is routed over the other fysical port. This means you still got the best storage performance. 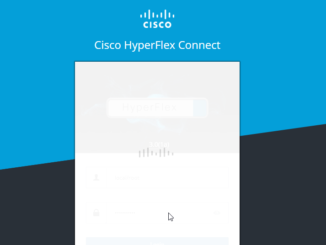 During a Cisco Hyperflex installation the Fabric interconnects are also configured. Cisco Hyperflex Edge don’t have any Fabric interconnect, so you will have to configure the switch manually. There is a good configuration guide at the Cisco.com site with examples of switch configurations. More information can be found at This Cisco Page Please note that you will have a partner cco account to view the configuration guides. You will need a vCenter which is already up and running before the installation. 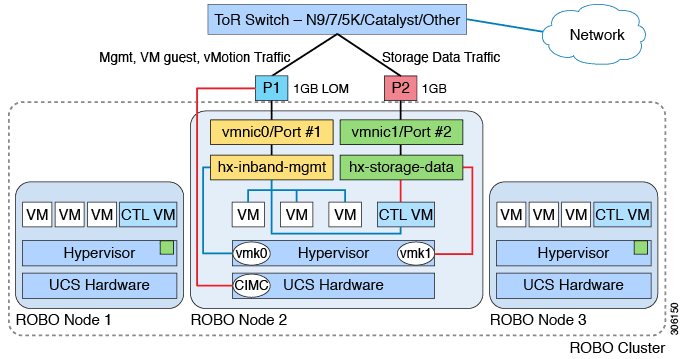 Networking 1G networking without Cisco UCS Fabric Interconnects. You will need HX Data Platform 2.0(1a) software which is released on April 7th 2017 ! I am a fan of cisco and the good thing about Cisco is they do care for small businesses. I do believe that Cisco HyperFlex Edge would be a good choice for small businesses.